In Part I of this blog series, I discussed what home energy monitors are and how they can help save energy and money. Here I unveil Part II, where I’ll go over key features of whole-house energy monitors and discuss a few considerations when picking a monitor for your home. We recommend consulting an electrician to install a home energy monitor. 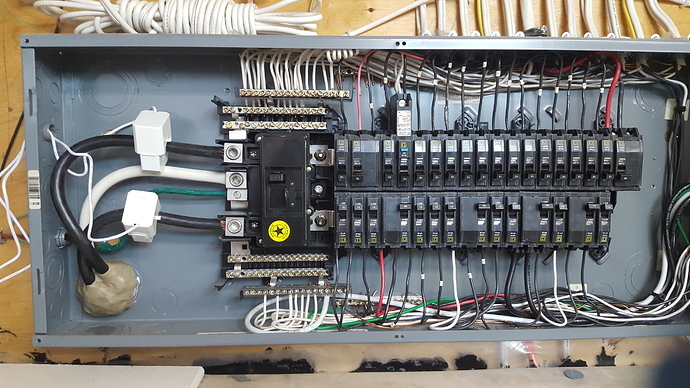 Many manufacturers of monitors market their devices as having do-it-yourself installation, but any project involving your circuit breaker comes with safety hazards. If you choose to install the energy monitor on your own, carefully follow the manufacturer’s installation instructions. If you opt to use a device that can monitor individual circuits, you will definitely need to bring in an electrician. This will increase the initial installation cost, but once installed the devices can reveal hidden inefficiencies and may quickly pay for the additional upfront costs. Does not require professional installation. Takes 15-30 minutes to install. These only monitor your two main lines with CT clamps. They monitor consumption patterns and identify individual devices with varying success. Takes 1-10 hours to install. These usually have 8-24 CT clamps. Two go on the main electricity lines, and the rest go on individual breaker circuits. Every circuit with a CT clamp is individually monitored. Every appliance plugged in and turned on in your house has a unique frequency and pattern of electricity usage. Some energy monitors that plug into the circuit breakers have appliance recognition; they can quickly determine the type of appliance it has detected and report on the electricity usage of that specific appliance. The monitor doesn’t pick up individual appliances under 30 watts, so if you want to know when your cell phone charger is on, you're probably out of luck. The monitor often confuses appliances. If two devices behave similarly, like toasters and curling irons, they may get confused. The technology does not always work perfectly, but it’s usually easy for the monitor to detect the big energy hogs like televisions, refrigerators, microwave ovens, etc. If it’s absolutely necessary for your monitor to “understand” every appliance in the house, opt for a multiple circuit device instead. Some—but not all—home energy monitors allow you to input billing cost rates as well as demand time when the rates are higher. This feature allows you to check the rates in real-time and reduce your energy cost by choosing to run certain appliances like washing machines or dishwashers during off-peak nighttime hours when rates are lower. Many energy monitors connect to a mobile application that can send you notifications about your appliances, tips for further savings, and warnings on abnormal appliance usage. Other than the DIY monitors, most energy monitors offer web or mobile accessibility to your energy usage data. Smappee allows you to store and export the past three years of data. Efergy E2 classic allows you to only store up to 2 years of data. Sense lets you access up to a year’s worth of data but fails to let you download any data. eGauge only has a web app; it's a bit old school, but it provides the best data download. Curb lets you export data for its set time periods (3 hours, 1 day, 1 week, 1 month, 1 year, and all). It is also really good at charting usage by circuit. Data access shouldn’t be a deciding factor in which home energy monitor you purchase unless you plan to download and post-process data. For homeowners considering installing solar or who already have it installed, some monitoring devices come solar-ready, allowing you to monitor your solar electricity production. Energy monitors with this option allow you to see how much energy your solar panels are generating, when it’s being generated, and how it is used. It is important to distinguish between household energy monitors and those for individual appliances. Household monitors plug into your energy meter and give you a complete energy-use picture; that’s the focus of this blog post. Some energy monitors are used to monitor a single appliance at a time and give you a more detailed look at that particular device. Plug-in monitoring devices like Kill A Watt EZ Electricity Usage Monitor and TP-Link Smart Plug, which cost less than $30, can plug directly into an outlet to measure a specific appliance usage. There are also similarly priced models that can be monitored and controlled through Amazon’s Echo Dot Smart Speaker with Alexa. If you need guidance in comparing the many home energy monitors on the market and selecting one that best suits your needs, contact us and we’ll be glad to share the draft of a detailed comparison matrix we’re currently developing. If you’ve already installed a home energy monitor and don’t know what to do next to reduce your energy consumption, we can work with you and recommend solutions to reduce and better manage your energy consumption. Finally, the Department of Energy provides helpful resources on how to increase energy efficiency once your monitor has identified efficiency opportunities.